Welcome to my blog. Here I share my insights on all things design. Hope you have a nice stay! Often times when we purchase a house, we can’t quite place our finger on what will make it great, even if we can feel its potential. Such was the case for this couple’s home. Light, bright and welcoming, the structure lent itself to the possibility of lots of entertainment, but was restrictive in its invitation; not nearly yet fleshed-out. Turnstyle Design was brought in to set the conversation between the space and what the homeowners wanted to experience: something distinctive and special. With this in mind, and with a requested focus in the kitchen, we set out to create a uniquely intriguing space, so as to immediately invite anyone in for celebration. The goal to create a bright, clean and inventive kitchen, meant to align with all the much-loved cooking and entertaining that is set to take place, now that the kitchen would be there to inspire it. With double colored cabinetry, which highlights the clean design and flow of the space, this kitchen is now set to give everyone creative workable space. A waterfall countertop further emphasizes beautiful cabinetry lines, and open-curved shelving allows cookbooks to be seen alongside a nice transition standing at the sink at the window. Floor to ceiling deco-inspired marble tile work, indicate the caliber and inclination of this space. 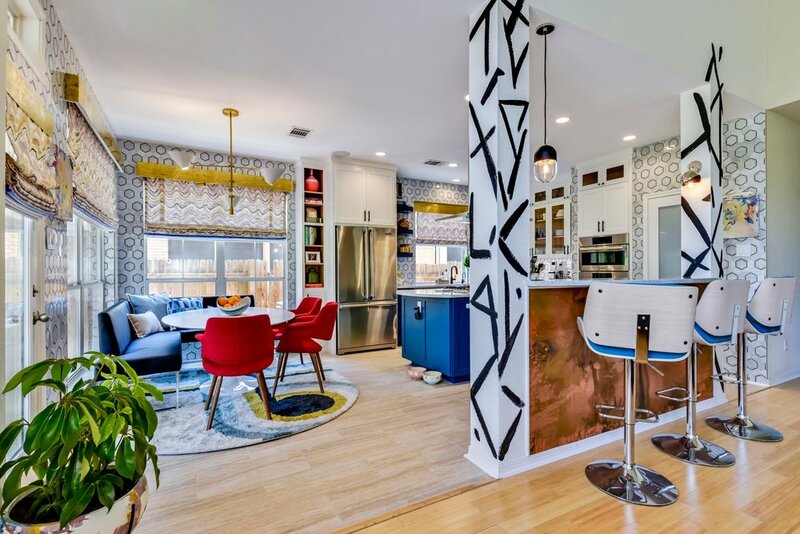 A skillful mixing of metals, highlights precisely the luxuriousness of all materials used, and the many artistic hand-painted touches, make this space high end, bold, and absolutely of its own personality. With fully custom builds and finishes, this kitchen meets every functional and inspirational need, and it encourages lots of lingering in the breakfast nook as well. With a corner bench and an oval tulip table, lounging and connective spaces appear in spades, making this kitchen the tone-setter for the rest of this very inviting home. Lieve Saether is the principal and owner of Turnstyle Design. Click here to read more about her and her passion for design. Get updates on all things design.